There have been some concerns with polybutylene piping (poly B), as a result some insurance companies flag this material as “high risk” and may charge a premium to insure. API recommends buyers contact their insurer for possible limitations on their policy. Most failures are related to improper installation procedures, and the use of aluminum crimp rings and acetal plastic fittings. These fittings have not been sold in the residential market since 1988. Although it is common to find these fittings in manufactured homes, they are rarely encountered in stick built homes in Alberta. These systems were often installed with a manifold system that balanced the hot water demand to reduce the possibility of scalding. These systems were considered a breakthrough but by the late 1980’s many households began experiencing leaky fittings. Originally it was believed the issue of poly B failures had nothing to do with the pipe, but was a fitting failure caused by elevated levels of free chlorine. However later reports suggested prolonged exposure to high levels of free chlorine may affect the service life of the pipe. The chlorine levels required to cause failure far exceed the levels found in Alberta drinking water. Also, some reports state that water flow in certain conditions can reduce the wall thickness of the pipe. The poly B industry estimates over 300 million feet of polybutylene pipe have been installed in over 250,000 homes in Canada since 1977. In Alberta, the installation of Poly B pipe ceased in 1997. The grey poly B pipe lacks an oxygen barrier; this not an issue with domestic plumbing but can result in problems with hydronic heating systems. This pipe allows oxygen to enter through the pipe back into the water and can cause premature failure by corroding ferrous metal parts in the heating system. Expensive parts like the pump and heat exchanger have been known to fail in only a few years. Using a non-ferrous heat exchanger is recommended (i.e. copper). Proper maintenance by a certified plumber and the addition of corrosion inhibitors like Fernox can extend the service life of the heating system. Later a red coloured poly B pipe was developed, manufactured with an oxygen barrier coating, this pipe eliminated the problem. An oxygen barrier cross-linked polyethylene pipe i.e. hePEX is now the material of choice for hydronic heating systems. Are you experiencing flickering lights, warm cover plates? Used in many homes in the Edmonton area from approximately 1967 to 1976. Aluminum wire became popular because of the rising price of copper in the 1960’s. Some insurance companies view aluminum wiring high risk and may charge a premium. 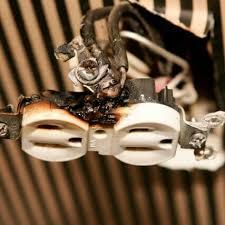 API recommends checking with your insurer for any limitations applied to your policy if aluminum wiring is present. There is some concern of a higher risk of fire with the installation of single strand aluminum wire. Single strand aluminum wire is mostly used on the 15 AMP general circuits throughout the house. For 15 AMP circuits, aluminum wire is AWG #12 which is one size larger than the same circuit used with copper. Multi strand aluminum wire is not a concern and is still used (with antioxidation paste) for main service wires and larger 240v circuits. i.e. A/C units, ranges and dryers. Proper installation and maintenance of single strand aluminum wire is important. The thermal expansion of aluminum wire is greater than copper. When the wire heats up from normal usage, the wire creeps causing the screw connection to become loose. Arcing then takes place as the current jumps from the wire to the screw. This arcing can lead to heat buildup and the possibility of a fire at the connection. 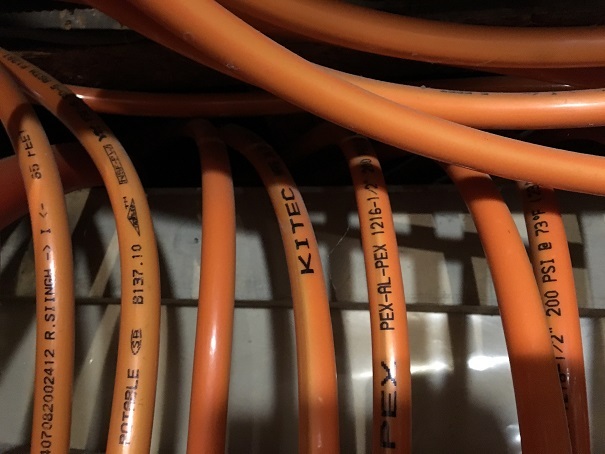 In the early 1970’s when the problems with aluminum wire started showing up, special connectors designated CUAL for the distribution panel and CO/ALR for the receptacles were developed. Also, all connections especially those between copper and aluminum should be coated with an antioxidation paste to ensure proper conductivity through the connection. CO/ALR receptacles are still available at hardware stores, but are much more expensive than standard copper-only compatible receptacles. Many electricians recommend pig tailing the switches and the receptacle connections. The is a procedure where a small section of copper wire is added onto the original aluminum wire inside the box so only the copper wire is connected to the screw. The splice is made with an aluminum compatible twist on wire connector with the addition of an antioxidation paste. The type of twist on wire connector used is very important typically these are brown or purple in colour. At inspections I see many homes pigtailed with yellow, blue twist on wire connectors. These are not aluminum compatible and require replacing… Also, modern Decora style switches and receptacles are not aluminum compatible and will surely require pig tailing. It is not necessary to rewire a home with aluminum wire; however, it would be prudent to have periodic inspections by a certified electrician. This water pressure piping was manufactured in Canada and was installed throughout North America between 1995 and 2007. Although the pipe was used for domestic and in-floor heating systems, I have only seen the pipe used for in floor heating in the Edmonton area. The pipe is manufactured with a thin layer of aluminum sandwiched between an inner and outer layer of cross-linked polyethylene. It is reported the brass fittings (marked Kitec or KTC) break down from corrosion referred to as dezincification. Some believe the problem is escalated by high alkaline content or if the water temperature is kept at too high a temperature. Failure is indicated by a buildup of white residue on the outside of the fitting or blackening and bulging of the pipe. Resulting in pipe failure and possible leakage. Some insurance companies may flag this material as high risk. At API we recommend checking with your insurer for any claims limitations or increase in premiums. The pipes are usually orange for hot and blue for cold. Although some other colours were used. To identify the pipe, look for any of the following pipe labeling: PEX-AL-PEX. PE-AL-PE or PERT-AL PERT. Brand names include KITEC, PlumbBetter, WarmRite, AmbioComfort, XPA, KERR, Plomberie Amelioree. A class action was settled, and claims must be filed before Jan of 2020. A claims Notice can be obtained by visiting: www.kitecsettlement.com. Registration should be made with the settlement even if there are no problems. Used as an electrical wiring method up until the 1950s knob & tube wiring has distinct characteristics that make it easy to identify. The cloth-sheathed hot and neutral conductors run parallel several inches apart to the lights and plugs and switches. Ceramic tubes are in the joists and ceramic knobs are included to make them secure, and change direction. The wiring is ungrounded and typically a larger 12-gauge wire was used for branch wiring. 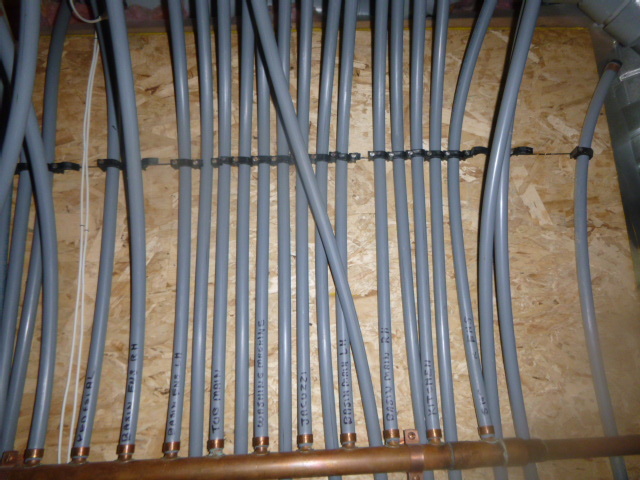 Although copper wiring does not easily break down under normal workloads, this wiring is old and has likely been over fused and overworked at some time. This causes the cloth sheathing to deteriorate, become brittle, and expose the conductors. This is a safety concern as I have witnessed many home owners conveniently hanging their cloths from the knob & tube wire in the basement. There are also fire concerns with this wire passing through combustible insulations. Most insurance companies in Alberta no longer insure homes with this obsolete wiring system. If knob & tube wiring is found at the inspection we recommend buyers contact their insurer before lifting conditions. It’s an expensive repair, but rewiring the house is often the only option. Vermiculite insulation was used from 1940s to the mid 1980s. It was considered a great insulation because it was easy to install and filled in cavities very well. It was mined in Libby, Montana by the Grace Company under the brand name Zonolite and provided most of the world’s supply. In Canada, the federal government provided grants to homeowners for installation through the CHIP program in the 1970s and early 1980s. Tremolite found naturally in the mining process resembles a microscopic lightning rod and embeds in the lungs when inhaled. Hemorrhaging results as the lungs try to heal, eventually suffocating the victim. This tends to happen over the long term, as much as 25-40 years after exposure. Vermiculite can be tested, this should be done professionally as an appropriate mask should be worn and samples should be taken in specific areas. If a major renovation is planned, complete removal of the insulation would be prudent. Contractors sometimes remove it through the soffit to limit the asbestos entering the living area. 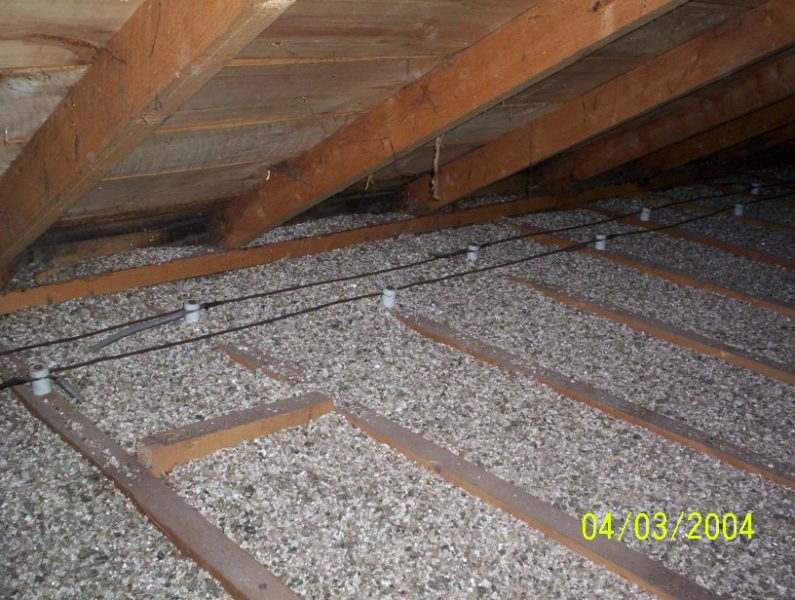 If it is determined the vermiculite insulation is not to be removed, stay out of the attic and do not disturb the insulation, as the asbestos tends to settle to the bottom, caulk around light fixtures and openings in the ceiling. Inform all tradespeople entering the attic for repairs. 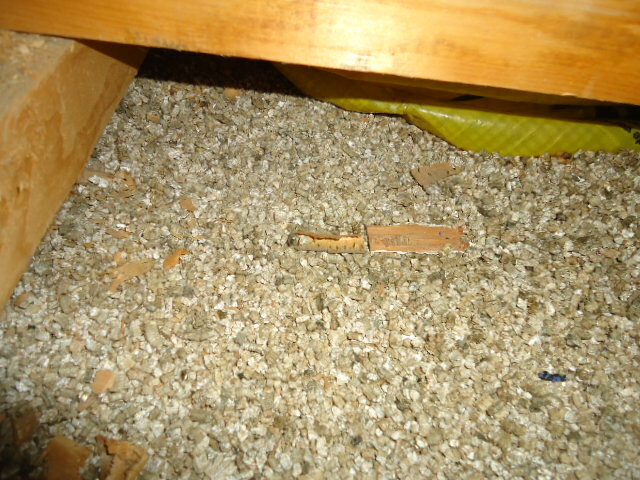 Vermiculite is expensive to have removed and must be removed professionally, it cannot be removed by the homeowner. Radon is radioactive gas found naturally in rock, soil and water. It is considered the leading cause of lung cancer in nonsmokers. Radon is invisible, odourless and tasteless and can be released into the home through cracks and gaps and openings in the basement floor. When inhaled, alpha particles release bursts of energy resulting in lung cell damage, which in the long term can lead to lung cancer. The risk depends on the concentration and the length of time of the exposure. Concentrations tend to be higher in the basement or lower levels of the home. A person sleeping or spending a lot of time in the basement would be at higher risk than occupants on the other floors. 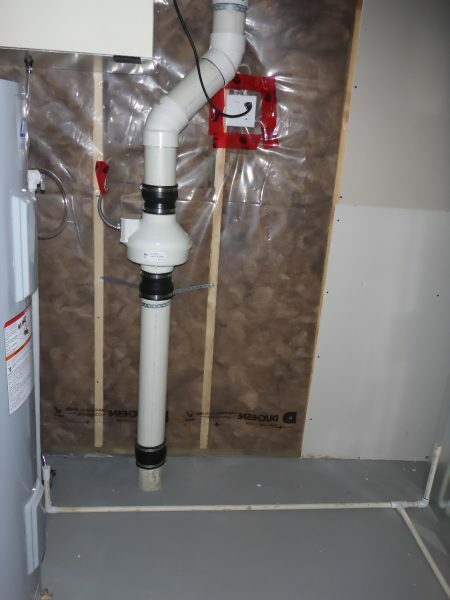 All houses will have some traceable amounts of Radon, it is believed approximately 7% of houses in Canada have elevated amounts that require attention. If elevated levels are recorded, sealing cracks in the basement may be all that is required to obtain an acceptable level. Mitigation devices can be professionally installed usually for under $2500. The National Building Code now requires roughed in mitigation devices be installed in all new homes. There is no regulation in Canada on determining what a safe level of radon is allowed, however in 2006 Health Canada developed a guideline which reduced the allowable level from 800 Bq/m3 to 200 Bq/m3 in keeping with standards set by other countries and the World Health Organization. The Alberta Government has recently passed Bill 209 the Radon Awareness and Testing Act. This act will provide Albertans with education and more awareness to the risks of Radon in coming months. The best test is a long term test as Radon levels can vary significantly over time. Three month to one year long tests are preferred. Test kits are available from hardware stores and the Lung Association for under $50. This includes the test kit, instructions and the lab testing fees. To purchase a Radon test kit call. 1-888-566-LUNG (5864).